High sleeper bed with a pullout futon guest bed which also incorporates a giant pullout drawer on wheels. Wardrobe, desk and shelving all built in to this children's bed. 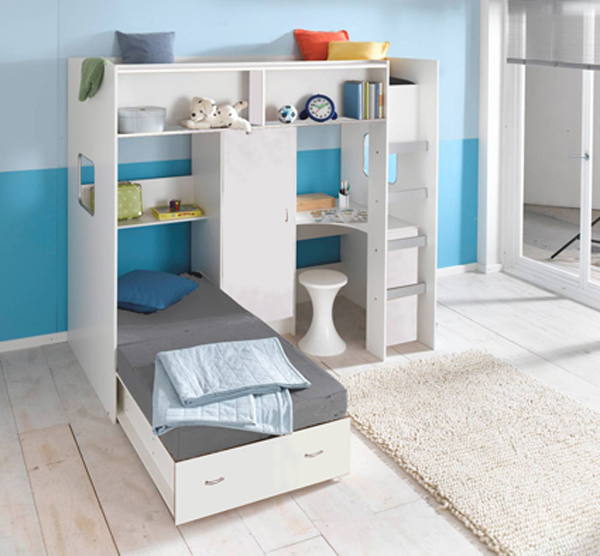 Children always need storage and this bed has loads for kids of all ages. MADE TO BRITISH STANDARD EN747 THE BRITISH AND EUROPEAN STANDARD FOR HIGH SLEEPERS. All the main end panels on our beds are made from one piece of material, unlike some lower quality beds that are made from various pieces of chipboard screwed together. Your child's safety comes first. PLEASE NOTE BOTH MATTRESSES HAVE A COVERING, BUT YOU WILL NEED TO USE A SHEET OR OTHER COVERING AS YOU WOULD DO FOR ANY BED. 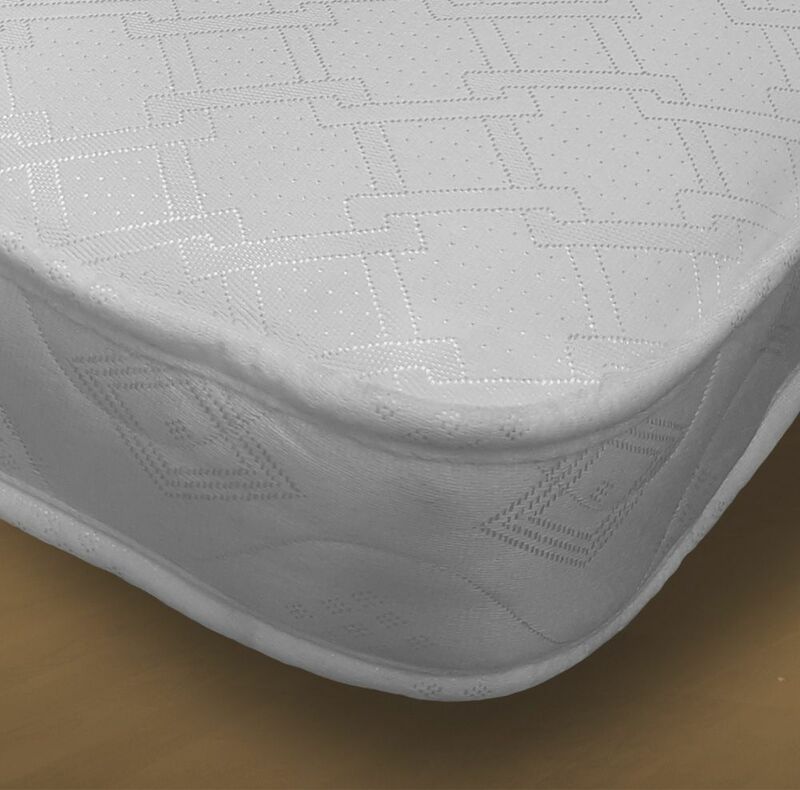 THE PICTURE SHOWS THE LOWER MATTRESS WITH SUCH AN AN ADDITIONAL COVER. WARDROBE, TWO BEDS, GIANT DRAWER (approx 72cm wide x 80cm deep x 20cm), DESK, SHELVING. The main cabin bed carcase is White. It is made from quality Melamine coated board, it is not just paper covered board. The largest of the cabin beds that we make, this full height cabin high bed is suitable for teenagers and adults. THIS CABIN BED HAS THE LADDER ON THE RIGHT HAND SIDE, AND IS NOT REVERSIBLE. The high sleeper bed has a single door wardrobe which is 140cm high x 50 x 50cm, with hanging rail, a 73cm high desk with a curved 90cm deep x 67cm wide work area. At the top is a full row of shelves and more shelves at the rear of the High sleeper seating area, making this a complete teenager/ childrens bedroom in high sleeper cabin bed. 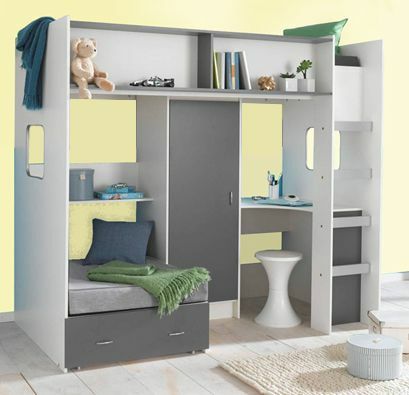 This cabin bed was especially designed for older children and is not recommended for children under 6 years of age. It has a total height of 182cm to the top of the bed. This exciting stylish children's high sleeper bed, which includes a bed base with 'breathing' holes, takes a full 3 ft (200 x 90cm x 15cm) mattress (our options include the ability to buy the bed with our De-Lux 200 x 90 x 15cm mattress) and comes flat-packed for easy home assembly! If you would like to buy the bed with the standard mattress for the upper sleeping area then it can be purchased separately. A 190cm mattress (English standard) will fit but there will be a gap. The cabin bed, ( also known as a high sleeper ) is made to British and European Standards by ourselves in the UK and supplied to major European retailers. For safety reasons the maximum thickness of mattress for this bed is 15cm. The bed has a giant pullout drawer on the left hand side with 2 big sections each approx 72cm wide x 40cm deep x 20cm tall. THE DRAWER IN THE HIGH SLEEPER BED WHEN PULLED OUT ALLOWS YOU TO MAKE A SPARE BED FOR VISITORS. The second picture above shows the bed with the 2nd pullout bed extended. Loft or Bunk style high sleeper cabin beds need to be made to a different standard than normal low beds for obvious safety reasons, the design tests include stability and ladder safety as part of the criteria. The loft cabin high sleeper bed comes with full easy to read assembly instructions and, if necessary, a 'help-line' contact number. This high sleeper cabin bed is made from melamine faced wipe-clean, scratch resistant board, it is not a paper covered high sleeper like many sold by UK discount stores. The cabin bed is very robust when assembled. Mattress, Bedding and textiles ARE NOT included in the standard price, however we offer them seperately. The mattresses we offer are shown in the pictures above - BUT MAY DIFFER IN COLOUR - GREY MATTRESS COVER NOT INCLUDED. The main one is a sprung mattress 200 x 90 x 15cm, the others are a pair of 95 x 80cm x 10cm foam mattresses. If you only want the bed and the large mattress then please buy that mattress from our on line shop separately from the bed, our offer on this listing is for either the bed, or the bed and all the mattresses you need. Bed measures approximately 203cm long x 111cm deep (upto 210cm when the 2nd bed is used) x 182cm high. 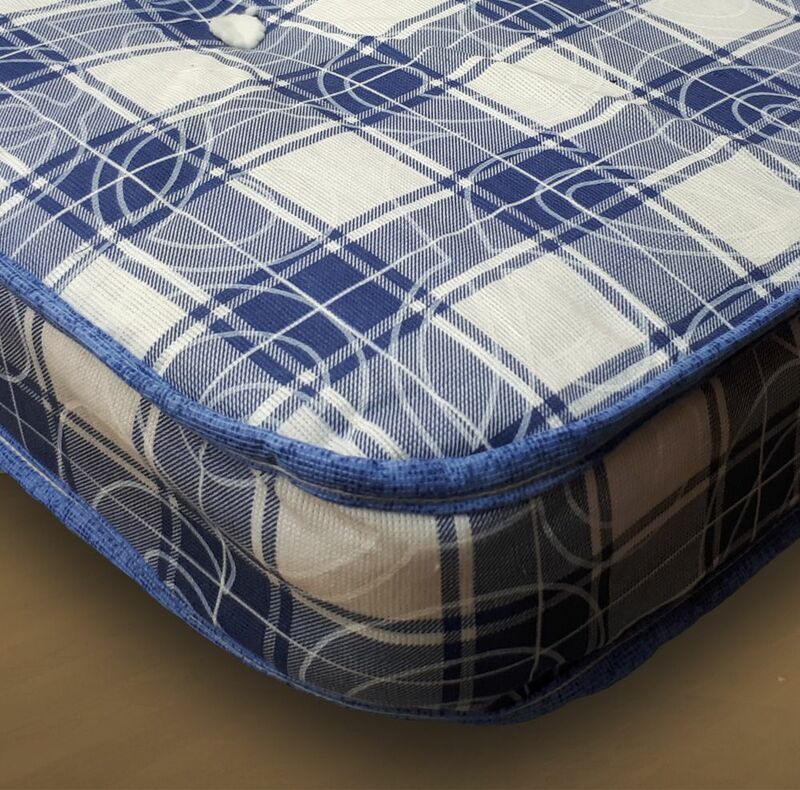 The main bed is 200 x 90cm wide, the lower bed takes a 190 x 80cm mattress, but if you want to use the mattress as a seat, we offer two 95 x 80cm foam mattresses. Delivery of this cabin bed is possible by a driver to England, Wales and south of (and including) Glasgow/Edinburgh regions of Scotland, but delivery may take 5-15 working days depending on geographical area (Scotland may take a little longer). We deliver our high sleeper cabin beds to each area in cycle so these are maximum lead times.